William the Conqueror's conquest of the North was not immediate. The northerners massacred his troops at Durham and York and murdered his appointed earls. It was only after William's "Harrying of the North" in the winter of 1069 that the conquest of the region began. 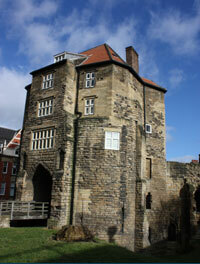 It was completed by the construction of Norman castles at York, Richmond, Durham and "New Castle". 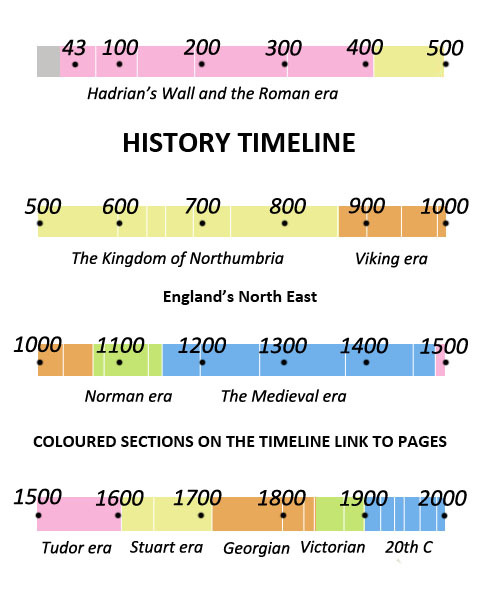 These became the strongholds of Norman control and authority in the North-East. King William appoints Copsig, a former lieutenant of Tostig, as Earl of Northumbria but Copsig is captured and beheaded at Newburn. Osulf of Bamburgh claims the Earldom but he is killed by an outlaw. William appoints a noble called Gospatric. Gospatric supports the Midland-based rebellion of Edwin and Morcar against the King but the rebellion fails and the rebels flee to Scotland. King William enters York and builds a castle. He grants Yorkshire to William Malet and Robert Fitz Richard. The troops are based at York Castle. Robert Comines, a Norman knight, is appointed Earl of Northumbria by the King. Comines' 700-strong army seizes Durham City and the Normans murder many people. Aegelwine, Bishop of Durham, warns Robert that he will be defeated. Early this morning a mob of Northumbrians broke the gates of Durham and stormed through the streets killing the Normans. Earl Comines flees for safety into the bishop's palace but is killed when it is set alight. The blaze threatens the western tower of Durham Minster but the locals pray and the wind diverts the flames. Only two Normans survive and flee. The natives of York besiege their castle. Robert Fitz Richard, a Norman commander, is killed. York is sacked by the Normans under King William. Churches including the Minster are plundered and the rebels flee. William builds an additional castle and the garrison is placed under William FitzOsbern. The Danes under King Sweyn enter the Humber with a fleet of ships accompanied by Edgar of Wessex who claims England's throne. They march for York. Norman soldiers retreat at Northallerton during a march north to attack Durham. Durham folk claim the Normans were frightened by a miracle fog created by St Cuthbert. The real reason is that they have the Danish invasion of York to contend with. The Norm ans prevent the Danes from making York their headquarters by burning it. But the fires burn out of control, destroying the Anglo-Saxon minster and killing many Normans. Danes fortify the Isle of Axholme near Doncaster but King William's army attacks them and they flee. William spends the winter at York. King William lays waste to the region in a campaign which will be remembered as the Harrying of the North, destroying all farmland and property between Durham and York. The area is reduced to wasteland by fire and sword. Many Northerners flee to the hill s.
St Cuthbert's Community returns to Durham from Lindisfarne with the saint's body only to find the town has been destroyed. 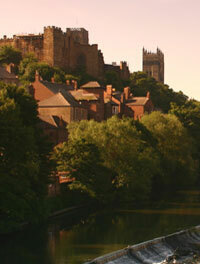 A worse discovery is that Bishop Aegelwine has robbed Durham of its richest treaures and fled. Scots under King Malcolm invade the North from Cumbria. They are victorious at Hunderthwaite in Teesdale before plundering Cleveland, Hartlepool and Monkwearmouth. Gospatric, the reappointed Earl of Northumbria, attacks Malcolm's territory in Cumbria. Thomas of Bayeux becomes the first Norman Archbishop of York. He starts building a new Norman minster. King William gives Richmond (Hindrelac) to Alan the Red, Count of Brittany, so he can build a castle. Alan also constructs a castle at Middleham for his brother, Ribald. William orders that the Archbishop of York must answer to Canterbury in terms of seniority. It is a demoralising decision for the North. Jarrow and Monkwearmouth monasteries are refounded by three Mercian monks. Waltheof, Earl of Northumbria, has been executed at Winchester for plotting against the king. Walcher, the Bishop of Durham, is given the earl's powers and becomes an Earl-Bishop. Scots under King Malcolm III ravage the North-East. Liulf Lumley, a Northumbrian noble, is murdered by officers of the Bishop of Durham. Liulf, a confident of the Bishop, had aroused jealousy among the bishop's men. Bishop Walcher agrees to meet Liulf's family at Gateshead to make peace. Arriving in Gateshead, the Bishop's peace-making words are drowned out by the mob which shouts "slay ye the bishop". Walcher takes refuge in Gateshead church but it is set alight. He is butchered as he tries to escape. The mob then attacks the Norman cas tle at Durham but the siege is abandoned after a four day onslaught. William sends north an army led by his brother Odo, Bishop of Bayeux, who destroys much land north of the Tees and steals valuable items from Durham monastery. Robert Curthose, eldest son of William, has built a "New Castle" on the Tyne. It is built out of wood and will ultimately give its name to Newcastle-upon-Tyne. The castle occupies the site of the Roman Fort of Pons Aelius and lies close to a small Anglo-Saxon monastic settlement called Monkchester. 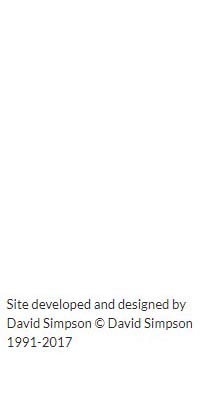 Little else is known about the site. Curthose built the castle on return from a military expedition in Scotland.